In the early 1960s John DeLorean was approached by GM&apos;s top brass about adding a two-door “personal luxury coupe” to the Pontiac lineup that would compete with Ford&apos;s successful Thunderbird and the Chrysler 300 series. Rather curiously. DeLorean passed on the idea stating that Buick would be better suited to market such a car. As such. the Riviera was born in 1963. But Pontiac took a slightly different approach. choosing instead to offer a model that combined bits from their existing lineup. rather than creating a whole new model. The Grand Prix. as it would be called. 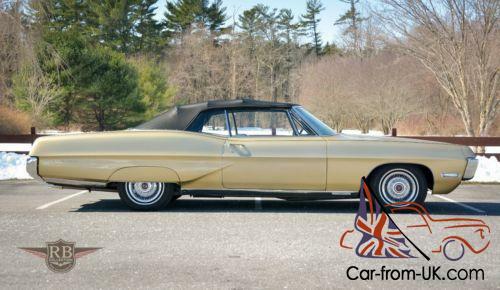 first appeared in 1962 (a full year ahead of the Buick Riviera) sporting the body of the full-size Catalina with performance and luxury equipment from the Bonneville. along with unique front and rear-end treatments. The Grand Prix served as Pontiac&apos;s range-topper and style leader. serving buyers who could not step up to a Cadillac Eldorado. but wanted some more performance than the Riviera had to offer. RB Collection is very pleased to feature this stylish and imposing 1967 Pontiac Grand Prix convertible. 1967 featured one-year-only styling and was the only year Pontiac offered a drop-top GP. with only 5. 56 produced. This fine example comes from the estate of a local collector who had a deep appreciation for large American cruisers such as this. 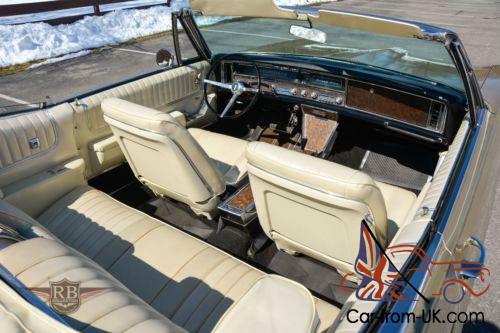 This car presents in outstanding restored condition. finished in beautiful Signet gold over a parchment interior. offset by a crisp black vinyl top and subtle black pinstripe. The paint quality is excellent. laid down over straight. wave-free panels. Panel gaps are even and consistent. evident that this has always been a solid and straight car. These were expensive cars when new. and as such. many were well cared for through the years – this is clearly one of those cherished examples. Aside from the excellent paint. the chrome trim and bumpers are likewise in excellent order. The distinct front bumper shows no signs of damage. dings or major flaws in the chrome. We love the parchment upholstery which is in outstanding order. with no rips. tears or major flaws to be found on the front bucket or rear bench seats. Extensive burl wood applique adorns the dash and center console. all of which is in good order. though some bubbling can be seen on the console below the ash tray. Otherwise. the dash. console and switchgear are in excellent original condition. The driving position is such that encourages a laid back. arm-out-the-window posture that is perfectly suited for cruising. As Pontiac&apos;s top of the line offering. it is of course well-equipped from the factory with plenty of power options. The power convertible top operates smoothly up and down. and is concealed by a matching white vinyl boot. Power windows and an AM/FM stereo are also fitted. The Grand Prix&apos;s styling signature was the concealed headlights hidden behind vacuum operated doors. Both doors operate smoothly. opening and closing in synch. This car even retains its original fender skirts. At some point in this car&apos;s history. 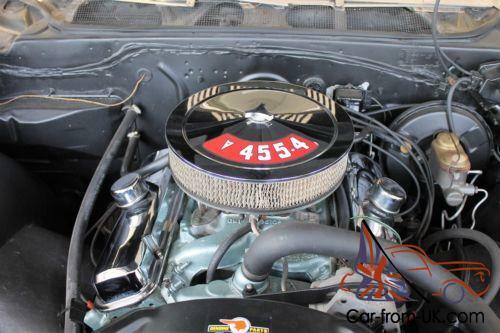 the original engine was changed out for a later model 455 cubic inch unit. Casting numbers reveal it to be from about 1972. The engine starts easily. runs very strong and is free of smoke or excessive leaks. It presents well under the hood in correct Pontiac blue with chrome valve covers. It is tidy. clean and honestly presented. Dual circuit power brakes and power steering allow for effortless cruising. The transmission shifts smoothly and kicks down on command. allowing the big Pontiac to waft forward on a wave of torque. We&apos;ve found this to be a thoroughly entertaining car to drive. It feels immensely solid as it glides along on soft springs. soaking up the bumps with ease. yet it retains that signature Pontiac performance edge to it. with predictable handling and plenty of grunt in spite of its size. 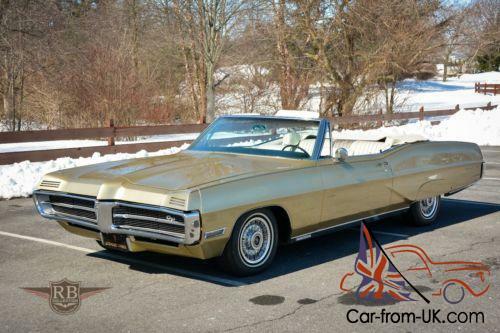 This is a wonderful example of a very rare and desirable full-size Pontiac from the pinnacle of GM&apos;s styling era. We are very fond of its honest presentation and excellent road manners. We always encourage in-person inspections and we are confident you will fall for the charms of this Grand Prix from the moment you first drive it. The sale will include a cover. top boot and some miscellaneous spare parts. Please contact Alex Ruozzi for more information on this fantastic Pontiac Grand Prix. Factory Options Condition Body PaintInteriorGlass WheelsExcellent GoodExcellentExcellent Excellent Motor TransmissionSuspensionBrakes TiresExcellent ExcellentExcellentExcellent 70%+ Tread Comments . 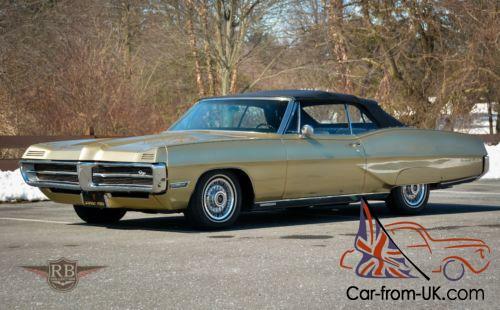 This is a wonderful example of a very rare and desirable full-size Pontiac from the pinnacle of GM&apos;s styling era. We are very fond of its honest presentation and excellent road manners. Please be ready to place a deposit within 48 hours of auction's close. All transactions must be completed within 7 days of the end of auction. If the car is not as represented upon your personal inspection at our dealership location. you will be under no obligation to purchase. Local residents are responsible for applicable sales tax in your county as well as title and licensing fees. If you live outside of our state. you are responsible for applicable tax. title and licensing fees in your area. Note: If the deposit is not received within forty-eight hours (2 business days) or if the sale is not complete within 7 days of the close of the auction. we reserve the right to sell to the next highest bidder or to another qualified buyer. If you are the winning bidder of this auctions please follow through with the transaction. Remember. your winning bid is a legally binding contract to purchase. International bidders are welcome. I will help in any way I can with coordinating shipping within the U. S. or overseas. Seller reserves the right to end this listing at anytime should the vehicle no longer be available for sale. Professional pre-purchase inspections are welcome but must be made before the auction ends. We have described the above mentioned vehicle to the best of our ability. However. with all pre-owned automobiles. the condition is subjective. so we recommend that the potential buyer fly out to inspect as well as test drive any of the vehicles before finalizing purchase. If your personal inspection is not possible. we will be glad to help facilitate an inspection by your chosen local independent service center and will make arrangements to deliver the vehicle to them for this purpose. All vehicles are sold in "AS IS" condition. However. extended warranty options are available on most vehicles. Please be advised that no oral statements concerning any vehicle constitute a representation or warranty of the condition of said vehicle. Our goal is to provide you with the best service and the most comfortable buying experience on eBay. We do not accept escrow. and all inspections must be done prior to delivery. ATTENTION INTERNATIONAL BUYERS: Please be aware that you will be responsible for the Federal Reserve fee(s) charged for all incoming wires). Pertaining to non eBay winners: anyone with a deposit but the sale is pending financing. 3rd party inspection or any other contingency. the said vehicle will not be held and is subject to be sold at any time. until all contingencies are removed and a manager or owner accepts and signs the purchase order. All used vehicles should be assumed to have some degree of wear. We do not manufacture our product. Each vehicle brand has its strengths. styles. tendencies. and shortcomings. Therefore. despite our best efforts to verify a vehicle's mechanical condition. we are not able to warranty a manufacturers workmanship or a previous owners diligence in care. It is for this reason that all vehicles are sold "AS IS" and there are no mechanical guarantees expressed or implied.